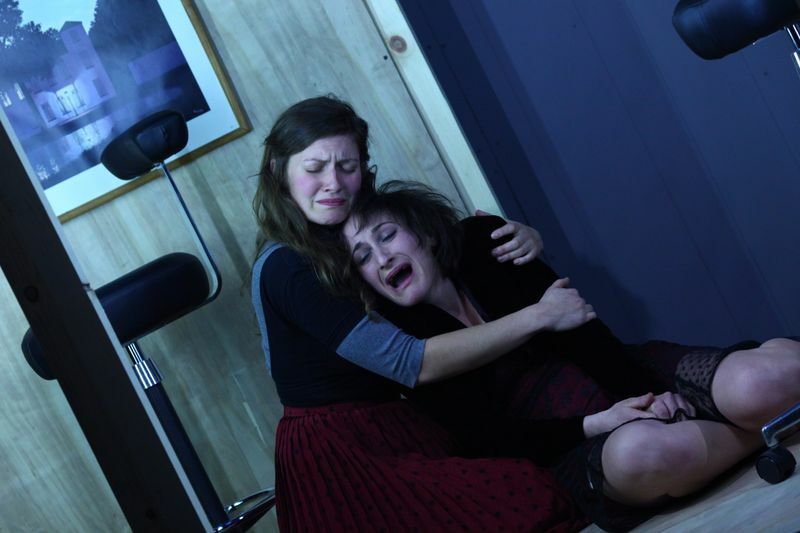 Incubator Arts Project’s Other Forces presented the return of Nellie Tinder‘s Evelyn, as Evelyn in Concert, this month. I would say, “Go!” like Andy did when it played at the Bushwick Starr a year ago but the work just completed its run and I am posting late like a “pig fool” (to quote Zoë Geltman’s Elisa). I wish I had seen the celebrated ’12 iteration too so I could speak to how it may have changed (my friend Michelle thought the cast seemed more comfortable and confident in this new staging which was co-directed by Abigail Browde and playwright Julia May Jonas). The work, Teorema-like, tells the story of a Pennsylvania psychiatric ward for women and girls that is turned on it’s head when Evelyn Henries (Hannah Heller), a movie star whose credits include Boy Matrix, arrives as a new patient and quickly seduces everyone. Jonas and co. use this narrative tradition, now refracted through the intimate lens of a chamber concert replete with xylophone, ukulele, autoharp, synthesizer, flute, and choral underscoring, to pose questions into community, identity, celebrity, pain and healing. The clinic is presided over by Dr. Katie Doctors (Lucy Kaminsky with the voice of a benignly indifferent blanket) and the black-velvet clad Gertie (Richard Saudek with amplified gravel voice and light-up headdress). Six patients live here, reality show: Brooke (Nikki Calonge), Nicky (Lisa Rafaela Clair), Elisa (Zoë Geltman), Becky (Mary Jane Gibson), Holly (Kate Schroeder), and Tiffany (Libby Winters). The amazing ensemble cast performs insecurities, neuroses, and trauma competitions. They take classes like interpretive dance, get graded on their meals (0-5), do a kind of walking meditation, smoke stage cigarettes when they can and regularly meet for brief sessions on uncomfortable-looking chairs with Dr. Doctors who shares mantras like, “we are all special” and “we don’t talk about looks.” When not performing, actors sit on carpeted blocks in an upstage semi-circle and watch the proceedings in residual character. Framing the space is a forest of fake fir trees, that classic site of liminality and transgression. There is some mocking of “safe space” but it is also earnest, right? The pain and confusion. Idk. It felt like Portlandia. When Evelyn hires a man named Michael (Saudek, in men’s clothes but feeling in double drag) to pose as substitute therapist, the patients almost sacrifice him in the woods but they ultimately eat Evelyn who really embodies their fantasies. “Can you understand a moonbeam” Gertie growls while brushing Brooke’s hair by way of clawing, adding, “Evelyn speaks her mind…you’re all kind of sponge-y.” Also, Saudek’s eyes are always “on” in playing at Gertie’s blindness; some heavy endurance acting. In wearing their desires and reflecting their anxieties, Evelyn (like a neo-Jacobean dramatic gear) begins to catalyze change and unlock repressed libidinal flows in the “fortress” of Pennsylvania House. When she says, “I ate lunch in the principal’s office,” Becky replies, “I’m a principle,” while Elisa adds, “and I eat lunch with her.” In one delightful Tarantino-ish moment, the lights change and Evelyn makes xylophone-accompanied eye contact with every other performer. Evelyn’s own transitive verb, however, seems to be to evade (the unconscious?) This drive expresses as a will to “manipulate” others and she succeeds although the cast eventually devours her, Perfume-ishly, concluding the nourishment arc with a believable trompe l’oeuil that leaves everyone bloody-mouthed for the closing number. Is this internalizing the other? Is it optimistic? The final song proposes a more poetic, curious, emergent orientation to psychic life that, as sung by Kaminsky’s Dr. Doctors, seems to collapse the psychiatric institution and remediate its prescriptivism with whimsical aporias like, “is there a separate you from your behavior” and “what is my mind doing / and what is this other thing that is watching my mind / and is it also my mind? / and is it good?” The twee pop balm rivals Life and Times pt. 1 and leaves us with the refrains: “and having a body” and “it’s just a question,” framing the show as a process of inquiry. Theater’s own contested therapeutic status is summoned up as we are invited to reflect on why we came to this point in our life and why we came to this theater. In one “show-stopping” monologue, Heller’s Evelyn transforms into the kind of theater-imploding Artaud-baby I have often wished to manifest onstage myself. Her Pollyanna-Dionysus performs the textbook inner child in a moment of ostensibly pure manipulation that is so magnetizing for feeling so true. The real fiction of her ironic breakdown throws up a deeply distancing and cathartic double image. At the threat of expulsion, she refuses becoming-analysant through an extreme inhabitation of the role, mocking the possibility of repressed trauma as she enacts it. I was unsure if the exaggeration/satire was to be read as a relation to contemporary expressionism at the level of the post-dramatic actor as well as the level of the character in psychological realism. The answer, I think, was no(t really) because there was a pretty earnest approach to actor-ly representation itself and she is still becoming-actor. Someone smarter than I might theorize the relation to becoming-woman. In the figure of Evelyn, is the inability to face experiences of vulnerability, loss, and anger revised to suggest the absence of those experiences? Is that possible? Is it rather a kind of protest against available forms of therapy and teleology? Heller’s vacuum-like vocal affect exaggerates vowels to the point of warping true clichés like “I’ve never felt really loved” into hypnotic sonic need. Accelerating counter-transference, she grabs at Kaminsky until, a cradled embodiment of therapist fantasy, her gentle kiss opens the floodgates of professional desire. Dr. Doctor’s transformation is most Shakespearean-ly extreme, wonderful, and heartbreaking. To bookend the show, everyone wears headbands with red flashing lights that stare at us like glowing eyes in the woods. Whose gaze is that? The Real of the chorus line? Such an exciting image.